Welcome to Singapore! Meet your travel companions and tour representative and proceed to get acquainted with one another over breakfast. Next, continue on a complete overview of the city on your expert guided tour. 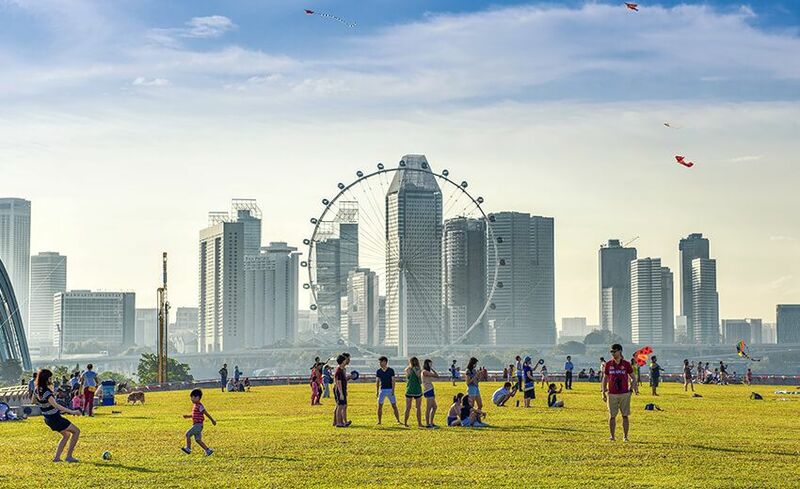 The tour takes you across the city to discover the different influences Singapore has had that brought about its unique fusion. 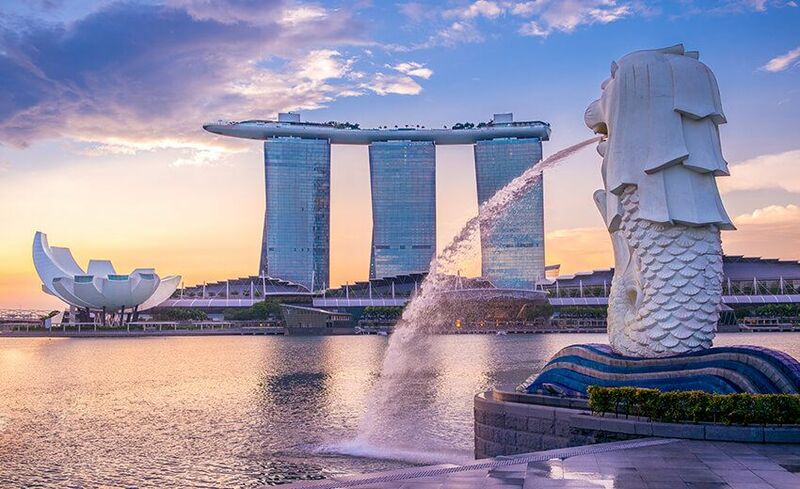 Quickly stop at the Merlion Park and Marina Bay to capture fabulous shots of the icon of Singapore along with the skyline ahead of you. 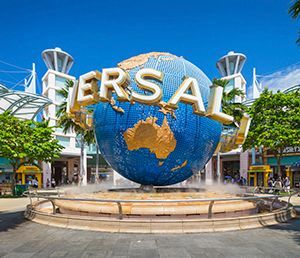 Next, pass the Civic District, Parliament House, Supreme Court, City Hall and National Orchid Garden as you learn about the history of Singapore. Move onto China Town, with a stop at Thian Hock Keng Temple and witness the Chinese inspired locality. 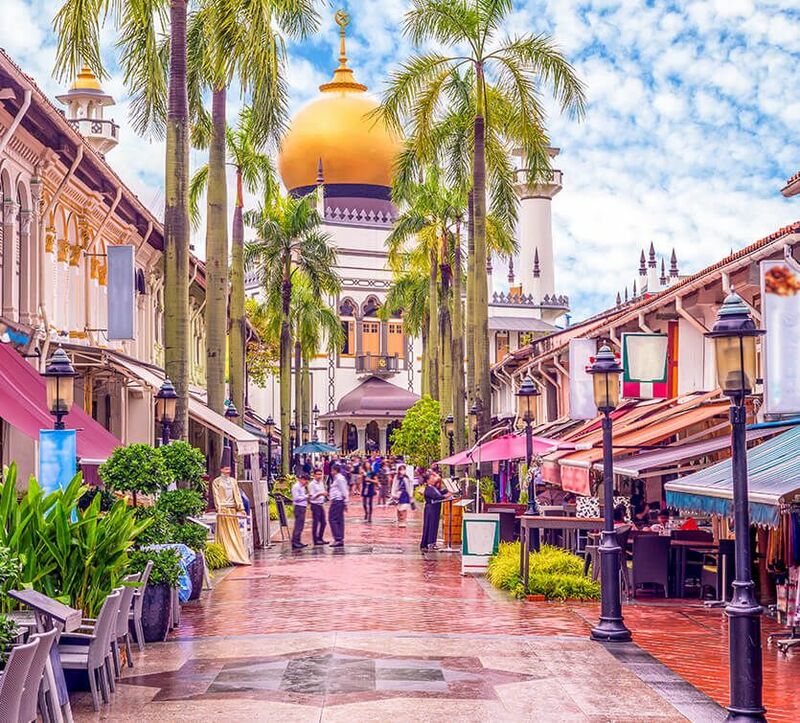 Lastly, visit the quaint and colourful district of Little India revealing the historic link between India and Singapore before a short ride to your centrally located hotel for check-in. The evening is open to doing as you please. Explore the city some more now that you are more familiar with it or take it easy at the hotel. Your stay is made convenient with the hotel being just an arm’s reach away from the shopping district of Orchard Road, city attractions and ample amenities. Overnight in Singapore. Polish off your appetizing breakfast before heading out for a memorable day in Singapore. 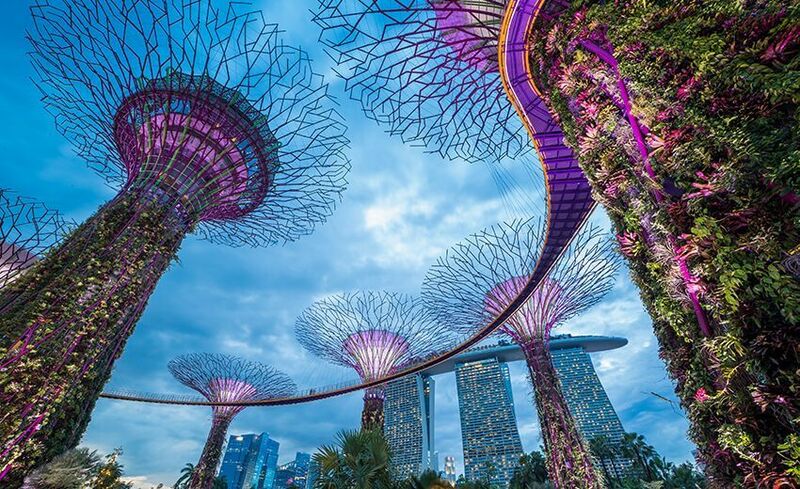 Start off at the incredible Marina Bay Sands Sky Park then onto the mesmerizing Gardens by the Bay ending the day at Sentosa Island. Located in the heart of the city, ascend 57 floors to the open-air observation deck of Marina Bay Sands Sky Park. The spacious area offers a 360 degrees bird’s eye view of the entire city. Singapore like you have never seen! Immortalize this moment with your cameras forever. Enter a world of its own at Gardens by the Bay. Move through the Flower Dome showcasing exotic flora, Cloud Forest, Supertree Groves standing tall up to 16 storeys high. A climb up the trees provide fantastic views of the gardens as well as Marina Bay. Watch the history of Singapore unfold in the Heritage Gardens. Continue further on to the Sun Pavilion, the Canyon, World of Plants, Dragonfly and Kingfisher Lakes. Stand in awe as you encounter rare art sculptures spread across the garden. The afternoon takes you to the beautiful island of Sentosa. Proceed for the Luge ride. The Luge hails from New Zealand and is the first in Southeast Asia. Simply put, the luge is a ground sled with a unique steering system that gives you full control of speed and direction. You can select from a relaxing cruise to the advanced Dragon Trail by your own. End the day with the impressive 3D show Wings of Time. This mesmerizing show by the sea is orchestrated completely of water, fire and laser effects entwined by a story of courage and friendship. In the evening, take it easy on your drive back to the hotel. Overnight in Singapore. First thing on your agenda today is a delicious breakfast. Next, come along for the optional full day adventure at Universal Studios or spend the day to explore at your own pace. 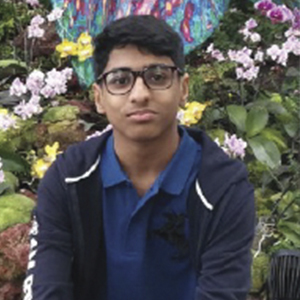 Enjoy the exciting day experiencing innovative rides, shows and attractions based on your favourite films and television series such as Shrek 4-D Adventure, Revenge of the Mummy, the Ultimate 3D Battle, Madagascar, Jurassic Park Rapids Adventure, Battle star Galactica, King Julien’s Beach party-go-round and many more! Don’t miss out on the Water world show – a live action movie with tons of stunts and pyrotechnics. After a sensational day at the theme park transfer provided back to the hotel. Overnight in Singapore. The day starts off with an appetizing breakfast buffet. 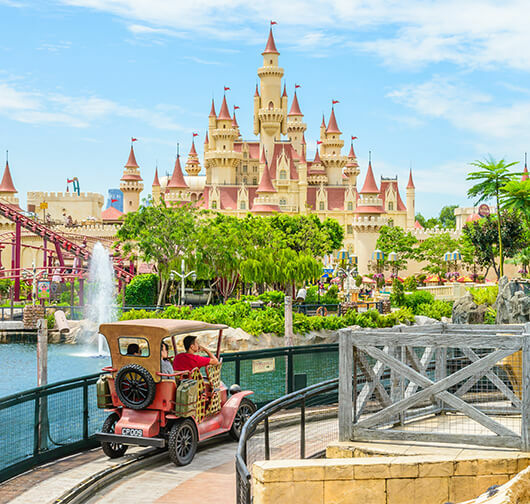 Partake to explore the animal and bird kingdoms of Singapore at Jurong Bird Park and experience the optional tour of Night Safari or the night is at your leisure. Only a quick ride away a visit to the bird Kingdom allows you access to a collection of 9,000 birds of more than 600 species; the biggest in the Asia Pacific. Admire the highest man-made waterfall, penguins from underwater world gallery, and spend your time at Birds & Buddies show. Also, don’t forget to take pictures with the colourful birds as keepsakes. This is followed by free time on your own for Lunch. 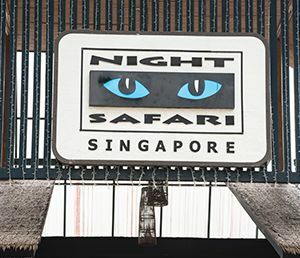 The evening comes full circle with a visit to the Night Safari, world’s first nocturnal zoo. Experience a tropical night forest through an open tram, visiting world’s seven geographical zones from the Himalayas to Asia Forest under the moonlight. The tram guide will share educative information like the nature of the animals & their habitats as you drive along the trails. Many of the animals are in open spaces, however, some animals like the leopard or lion are visible from a glass observatory. Last but not least; enjoy a unique spectacle where some nocturnal animals display their fascinating behaviour and a performance from the talented tribal warriors. Free time to grab some food from the stalls devised with a traditional village ambience. Relax as you proceed to the hotel for a good night sleep. Overnight in Singapore. Begin your day with a ready breakfast buffet. 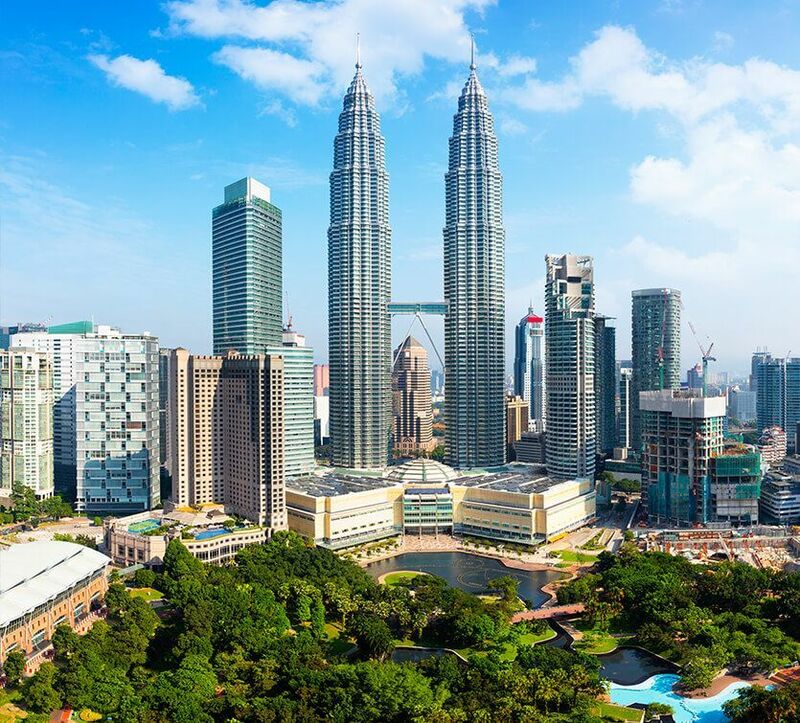 Next, board the coach and get comfortable as you make your way to Kuala Lumpur. Distance covered: 352KM Upon arrival, head straight to the hotel for check-in. Overnight in Kuala Lumpur. After breakfast proceed to explore the city with an expert English-speaking guide. The coach takes you to marvel at the sights of the city. The famous Cocoa Centre offering over 300 varieties of chocolate goodies. Durian Chocolate is highly recommended to try. Next, to the King’s Palace for a quick photo stop. The palace was built in 1928 and has since been passed down from a Chinese millionaire to Japanese officers and finally renovated for the Malaysian King. The National Monument includes 5 components; the monument, the pavilion, gardens, fountains and war memorial. 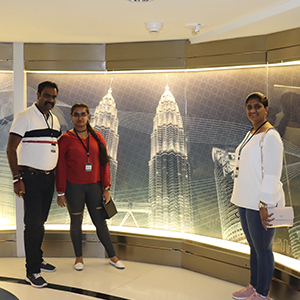 The sculpture was constructed as a tribute to the soldiers who fought for the country’s independence, National Mosque, a 13 acres visual delight, Independence Square, the iconic Petronas Towers; world’s tallest twin structures and KL tower standing tall at 421 meters. Putrajaya is the administrative capital that occupies close to 5,000 hectares with plenty of well-maintained attractions as such as Seri Wawasan Bridge shaped like a sailing ship, Perdana Putra prime minister office, Palace of Justice, Putrajaya International Convention Centre, Seri Gemilang Bridge, Anjung Floria and Seri Saujana Bridge. 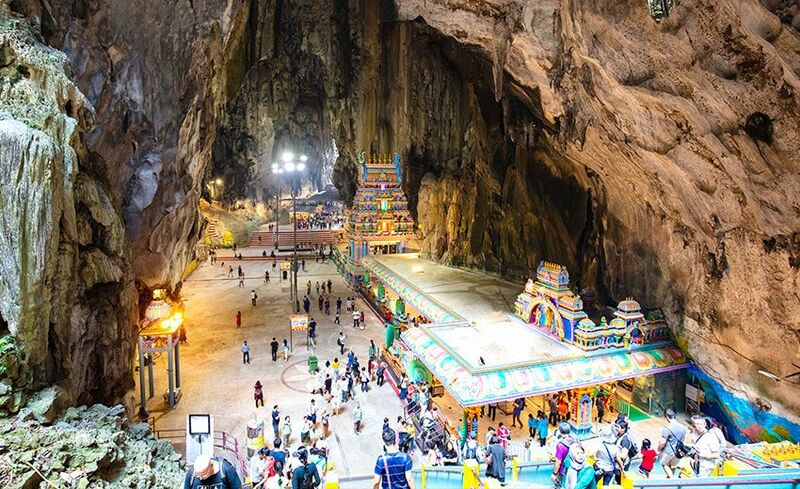 Before the day ends, visit the famous Batu caves which is one of the most popular Hindu shrines in Malaysia, dedicated to Lord Murugan with 272-step stairway leading to the cave entrance. After your insightful tour, transfer provided back to the centrally located hotel. The evening is kept open to proceed as you please. Overnight in Kuala Lumpur. Begin your day with a good breakfast and get ready for a fun filled day at the Sunway lagoon Park. The theme park is a collection of 5 parks in 1; Water, Amusement, Scream, Wildlife and Extreme Park. Ideal to cool off from the tropical heat is the water park with a manmade river, beach to surf on, wave pool and more. The amusement park is all about fun! 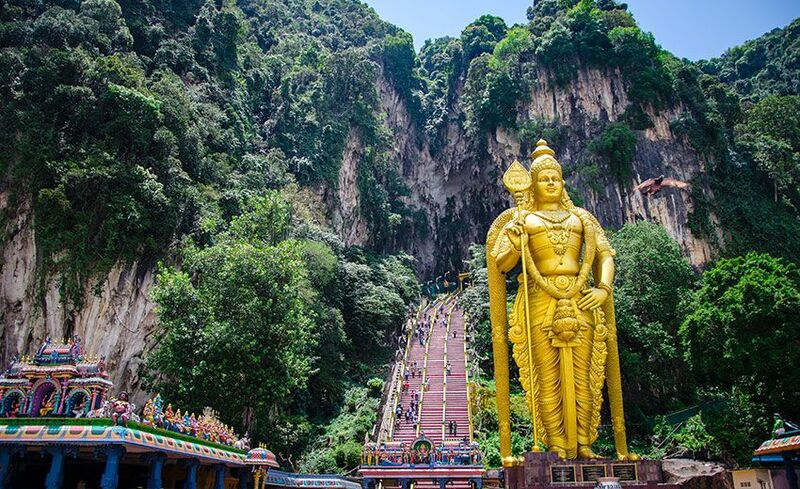 Offering many roller coaster rides that can be enjoyed by the whole family along with Malaysia’s longest pedestrian bridge. The wildlife park is a full-fledged interactive zoo and aviary attraction boasting rare species like the white lions, white tigers and many more. Get a chance to get up close and personal with the animals and observe them. The Extreme Park is a top spot for the thrill seekers. Turn up the adventure notch with bungee jumping, flying fox and even a sling shot ride that takes 2 seconds to reach from 0 to 120 km. Lastly, the latest addition to the collection is the Scream Park catering to horror theme. Exactly as the name suggests, this place has one mission; to get you screaming for your life! After an action packed day evening return to the hotel. 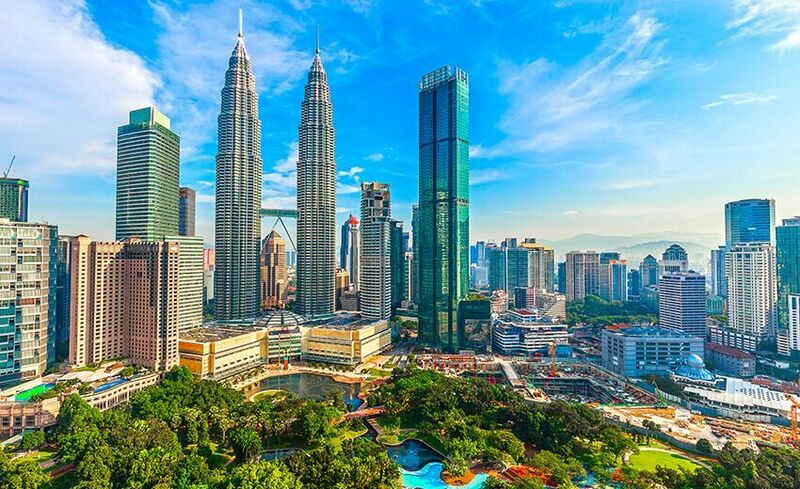 Overnight in Kuala Lumpur.